We are proud to offer both inpatient and outpatient therapy to those in our care and in the surrounding communities. Our facility provides an experienced rehabilitation team that is committed to providing outstanding results and excellent quality of care. 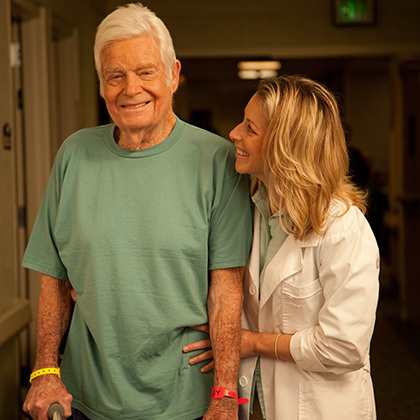 Residents are empowered through individualized programs to reach goals of increased independence and ability. Resident families are also encouraged to participate in therapy sessions, caregiver education, and training. We apply the physical properties of water to therapeutic modalities and exercise prescriptions to help rejuvenate and rehabilitate the body. Water becomes the treatment table, the massage applicator, the pain-reducing stimulator, and the exercise gym as part of an individually tailored, comprehensive therapy treatment plan. Water heated to therapeutic temperatures relaxes and massages muscles to reduce pain and tension. Buoyancy decreases weight-bearing stresses placed on joints, which often minimizes or eliminates pain and improves range of motion. Hydrostatic pressure increases cardiovascular efficiency and can help decrease swelling or edema. The viscosity of water provides resistance for strength training in all directions of movement. The body’s positional awareness is enhanced, which reinforces good posture and assists in balance training. 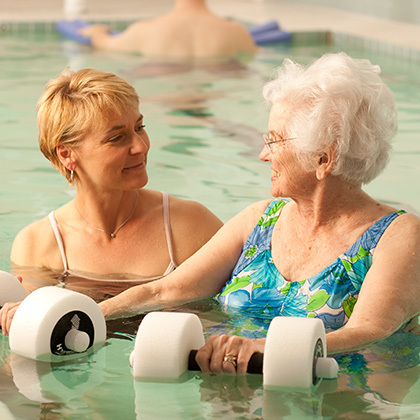 Aquatics’ is a fun alternative to traditional exercise methods increasing and improving participation and outcomes.